$31.62 billion in sales: that’s the forecast for the digital signage market by 2023, according to Orbis Research. But numbers alone cannot convey the opportunities and challenges for digital signage providers in 2019. While retailers need to reinvent their spaces to stay relevant, experience designers and content creators are keen to leverage new technologies as storytelling tools. That trend and others suggest the digital signage industry is both evolving and adapting to meet the needs of rapidly changing commercial verticals. Like Fashion Week for designers and brands, New York Digital Signage Week (NYDSW) has established itself as a premier showcase for the digital signage industry. During five electrifying days, October 29 – November 2, 2018, more than 4,500 visitors enjoyed 32 free and ticketed events, including conferences, seminars, tech demonstrations, networking parties, debates, tours, and pop-up activities. There was even a scavenger hunt thanks to Open Eye Global. Managed by The Ministry of New Media, NYDSW’s popularity reflects an engaged digital signage industry. It also illustrates an increasing demand for smarter, interactive, and experiential designs. Jeff Hastings, BrightSign’s CEO, appreciates how Digital Signage Week breaks the tradeshow mold by including a mix of events—some for industry professionals, some open to the public, and some invite-only events. 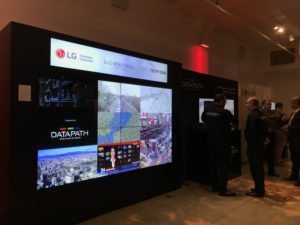 “It’s a great opportunity to rub shoulders with colleagues across the industry, but also to educate the broader public about the latest breakthroughs in digital signage,” Hastings enthused. Kurt DeYoung, VP of Channel Sales at Barco, said NYDSW gives his team the chance to interface with a broad cross-section of work types, such as AV consultants, media, integrators, engineers, UX, experience designers, and artists. The ability to connect with such diverse professionals is “really helpful to get the voice of the customer,” said DeYoung. 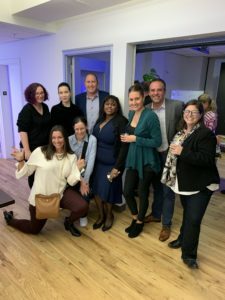 NYDSW was also a meeting place for the AVIXA Women’s Council NYC Metro Group and The Women of Digital Signage, the organization providing women in the digital signage industry with a pathway to promote networking, mentoring, and personal growth. Another reason the digital signage industry is inspiring confidence is its embrace of emerging technologies. As app personalization and IoT-connectivity become staples of the residential user experience, digital signage vendors are adding more AI, sensors, facial recognition, APIs, geolocation, and responsive functionality into digital kiosks, menu and transit boards, billboards, and videowalls. System on Chip (SoC) is now four years old, and the demand is growing for digital signage that can offer streamlined multizone, reporting, and live streaming. Cloud-based solutions are also on the rise. Samsung’s Shari Sentlowitz said that she anticipates growth across all digital signage verticals but especially in quick-serve restaurants, stadiums and arenas, cinemas and retail stores. Smart Signage and LED technology play a large role in attracting customers to various venues including the sports, cinema, or retail spaces. “Consumers constantly challenge businesses to deliver top-quality and efficient customer experiences, a standard that is always changing given the rapid pace of advancements in technology,” Sentlowitz explained. LED is a natural fit for corporate branding, brand recognition, and accuracy of color reproduction are essential. DeYoung pointed to the LED-driven Barco UniSee as a seamless canvas. Jeff Hastings, BrightSign’s CEO, believes that 2019 will be a pivotal year for the retail sector. Facilitating that reinvention is the deployment of immersive technologies that elevate the user experience. To achieve that goal, some vendors and installers are exploring ways to work with creators, UX designers, and experiential designers. While content creation might be considered outside the traditional AV scope, it’s beneficial to collaborate with “creators of ‘the wow,’” said DeYoung. The SEGD (Society for Experiential Graphic Designs), for example, exists to “educate, connect and inspire” the global, multidisciplinary community of professionals creating experiences that connect people to place. Though the processes may be different, an experience designer and AV integrator share a similar goal: to create exceptional experiences. Resolution and hardware specs will always be important, but many industry professionals are thinking more boldly, crafting strategies to deliver engaging integrated experiences. As DeYoung articulated, the more clients that say, “We want to create something that’s never been seen before”, the more opportunities will grow for integrators. Margot Douaihy is a writer and storyteller. She serves as the Editor-at-Large of AV Technology magazine.